We here at Socked – quite naturally – tend the emphasise the importance of quality socks to the modern gentlemen. However, this advice counts for nothing if your hose is accompanied by shoddy footwear. 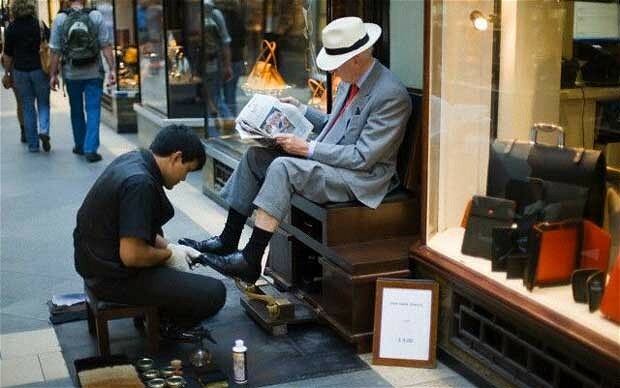 Shoes make the man, and if you do not have a valet or gentleman’s gentleman to apply the daily shine, then you should learn to do it yourself. There is no excuse for arriving at an important meeting, a rendezvous with a gentlewoman, or even going about your daily life with inappropriate or scruffy shoes. Our great-great uncle Buckfastleigh was proud of the fact that he managed a mirror shine on his boots every morning, even when he was caught up in that nasty business with the Retreat from Kabul in 1842. Tragically, the glint of his daily shine caught the attention of a Ghilzai sniper, who shot his foot right off from under him. As luck would have it, regimental carpenter Mr Sheen fashioned him a wooden one by way of replacement, and supplied him with a furniture polish of his own devising, which he found some success marketing on his return to England. This lesson aside, we urge the reader to eschew the mass-produced and synthetic uppers from modern footwear-u-like warehouse stores, and seek out real leather for genuine comfort and class. Only this way can you achieve a true shine. And with great shoes comes great responsibility, and the gentleman should learn to care for them properly. Say ‘no’ to liquid polish that gets on your socks and carpets, and buy yourself a tin of the real stuff, some shoe brushes and a quality duster. We trust that this lesson will prove invaluable, and that the tragedy of great-great uncle Buckfastleigh’s foot will not be in vain. On the road to Peshawar, somewhere near the Khyber Pass, lie a pile of old bones and one obsessively shined boot that will be forever England.